Excited to be included as a guest on the latest season of Real Talk Radio with Nicole Antoinette! We talk about adventures, wildlife rehabilitation, living with an invisible chronic condition, and of course, the Arizona Trail and my upcoming book with Wilderness Press. I met Nicole when she was thruhiking the Arizona Trail in 2017, and it was so great to reconnect with her and chat about our experiences. I hope you enjoy listening as much as I enjoyed recording it! It’s that time of the year to look back and I’m grateful to say that personally and professionally, 2018 has been one of the best! Before I begin, I wanted to highlight a recent story I was a part of for KJZZ Phoenix, the local NPR station. It’s by Stina Sieg, called Take a Hike: Author Explores, Promotes Diversity on Arizona Trails. At the beginning of the year, I didn’t really know what 2018 would look like. It ended up being one of the most eventful and travel-packed years I’ve ever had. If you’d like more frequent updates, follow me at @desertsirena on Instagram or you can also view my feed by visiting this website on your computer and clicking on the latest photo in the upper right. Big thanks to the organizations who have supported my work and adventures this year: Arizona Office of Tourism, Gossamer Gear, REI, the Town of Tusayan, Pima County, Visit Tucson, Wilderness Press, Huppybar, Purple Rain Adventure Skirts and more! Started the year out right with a hike from Superior to Kelvin on the Arizona Trail with my adventure bestie Wendy. This was the seventh time I’ve hiked this 40 miles, one of my favorite parts of the AZT. I decided at the beginning of the year that I was going to commit myself to writing my memoir and found a place to work on it far away from distractions. It was emotional, revisiting the dark days when I was really sick with fibromyalgia but also inspiring to see how far I’ve come. The Arizona Office of Tourism contacted me about partnering with my company, Trails Inspire, to do two talks at the REI flagship store in Seattle and of course I said yes. I attended Winter Outdoor Retailer with Gossamer Gear and had a great show. I had talked to Wilderness Press at the last summer show about my memoir and an idea I had for a book about the best day hikes on the Arizona Trail. When I saw them at winter show, they gave me the contact for submitting a proposal. For me, the show isn’t about the gear, it’s about making relationships and learning at the talks and workshops. I was particularly interested in the Indigenous Connections panel and When Women Lead series. Learning about ancestral land acknowledgements has inspired me to include them in my social media and blog posts. For example, I am based in Tucson, AZ, ancestral lands of the O’odham and Yaqui. I use https://native-land.ca/ as well as other research to determine and acknowledge who’s land I am recreating on. Hiked Apache Peak on Oracle Ridge, which I’ve looked at for years. Great 360 degree views in every direction! Ancestral lands of the Hohokam. I got a lot done on my memoir in January and continued working on it. Until I got an email from Wilderness Press on a Friday that said they would like a full proposal for the Arizona Trail day hikes book by Tuesday. I was excited, this was the moment I’d been waiting for! Only I got the email about 20 minutes before I left for the airport to do my talks in Seattle all weekend. I didn’t see much of Seattle, but the talks went really well! I recorded a short bonus show on the Cascade Hikers Podcast about it. Ancestral land of the Duamish and Puget Sound Salish. My brother and his fiance came to visit from Chicago for my birthday and we had a blast hiking 7 Falls in Bear Canyon and the Arizona Trail near Oracle. Ancestral lands of the O’odham and Yaqui. My friends India and Wendy got me the most thoughtful present, a metal print of one of my favorite light painting photos I’ve ever done. This was taken on the Black Bridge on the South Kaibab Trail which crosses the Colorado River in Grand Canyon. I climbed Baboquivari Peak with my friends Dave Baker, Gary Hervert and we even got Wendy up there! Baboquivari is the center of the ancestral lands of the Tohono O’odham. When I heard that Pima County was going to complete The Loop trail system and have a celebration in mid-March, I got the idea to do a promotional urban hike of the trail. I contacted Pima County and Visit Tucson and they were thrilled with the idea. I even got them to fly Liz “Snorkel” Thomas, the Queen of Urban Thru-Hiking, out to join me. Hike the Loop covered all four riverwalks and two greenways of the system, 80 miles in 5 days. It was a hike that delivered so much more than I’d anticipated. The views, the history and archaeology, art and amenities were all a fantastic part of the experience. We partnered with local restaurants to highlight Tucson’s UNESCO International City of Gastronomy designation, and interviewed people involved with different municipal projects that helped to create The Loop. Ancestral lands of the O’odham and Yaqui. We opened the last day of the hike into the completion celebration to the public and it was so rewarding to take these people, many who had never hiked before, on The Loop. We even had Jasmine the Mini-Donkey and Leigh Anne Thrasher along! Please take the time to watch this video, it is one of my very favorite moments of the year. Liz and I got a lot of media attention, you can watch the highlights here. Joined the list of Badass Women of Tucson, a great series by the Arizona Daily Star. A reporter came out and interviewed Liz and me on The Loop. I was featured on Coalition Snow’s Tacover Tuesday, where they invite women to talk about their businesses and the outdoors. The Tusayan Trails Master Plan held a comment period open for 45 days and I ran a public meeting at the end of March for my company Trails Inspire. I was featured on the She Explores blog: Blaze Your Own Trail, by Hailey Hirst. On March 31st, I started a week-long trip in Grand Canyon from the South Bass Trail to Hermit. That’s the same trip that I tore my calf muscle and had to be evacuated by helicopter on April Fool’s Day 2016. Two years to the day, I was back and walked past the spot without incident. This trip was solo and absolutely wonderful. It also connected up a large piece of the Grand Canyon Traverse for me. Of the 277 river miles, I have now done from Nankoweap at mile 53, to Elves Chasm at mile 117, as well as Tuckup 164 to Toroweap 179. The Navajo, Hopi, Havasupai, Paiute, Hualapai, Zuni, White Mountain Apache and Yavapai Apache are all traditionally associated tribes in the Grand Canyon region. After my Grand Canyon trip, I did more trail layout work in Superior with Evan and Neil. Trails Inspire was featured on The Trail Show, talking about Hike the Loop. Did a new talk, “From Suburbanite to Adventurer” for Summit Hut Women’s Night, then the next day drove to Silver City, New Mexico to attend the Continental Divide Trail Days event. I gave my presentation on Desert Hiking Tips and Tricks to a packed room. I’ve been told the talk is very good, but a little on the scary side. It’s amazing how comfortable I’ve become in my desert home. Ancestral lands of the Chiricahua Apache. More trail layout in Superior, trying to get the job done before the sweltering heat. On May 5th, Hike Like a Girl Day, I appeared on Rosie on the House, a home-improvement radio show that devotes its first hour to the outdoors in Arizona. We had a great time talking about Trails Inspire projects and the Arizona Trail. The Arizona Office of Tourism and REI sponsored a Force of Nature event and I was invited to speak. Though it was 100 degrees, it was an inspiring event at gorgeous Lost Dutchman State Park. Ancestral land of the Hohokam and Yavapai. Baby season started at the Wildlife Rehab, makes for long shifts but worth it for the cute! Here’s a collage of my favorite photos of the year with Janet Miller, who runs the facility, in the middle. Did some light painting collaboration in Oracle with my friend Drew at El Rancho Robles. I signed my first book contract! Day Hikes on the Arizona National Scenic Trail, coming in Spring 2020 with Wilderness Press. I can hardly believe it, such a dream come true. I have until November 2019 to do the research and writing. The first thing I did after getting my book contract was to get in touch with my friend Cate Bradley. She used to work for the National Park Service Rivers, Trails and Conservation Assistance Program and is now retired in Silver City. She worked with me to plan out the next year and a half and I am forever grateful. I also approached the Arizona Office of Tourism for a partnership that would help with my travel expenses while researching the book. They accepted and I am doing several talks and writing a series of articles and social media posts that will be released closer to the publication of the book. On June 13th, I packed up and left for my first book research trip to the Utah Stateline Trailhead, the Kaibab Plateau, North Rim Grand Canyon and Flagstaff. It was so much fun, revisiting my favorite parts of the AZT and doing the research and photography. Ancestral lands of the Ute and Kaibab Paiute. My best friend of 40 years Kristin and I went on a mini-vacation to Wisconsin to go tubing and to the kind of bars where you drive a boat in. Also did some urban night photography. I had a reunion with people I used to work with almost 30 years ago as a video game tip line operator for the Turbo-Grafx 16 video game system. What fun! After 11 days in the Midwest, I was ready to come home. I love my family, but my heart is in the desert. Monsoon season was welcome, I got quite a surprise to find that hundreds of spadefoot toads were living right outside the place we moved to last year. Their songs on monsoon nights were incredible. I helped organize a reunion of the Crazies, the trail crew I volunteered on for many years. Many of these guys are in their 70’s and 80s now but some are still doing trail work. We had such a nice time reminiscing and catching up on Mount Lemmon. The second half of July is all about conventions: first, the Arizona Governor’s Conference on Tourism (AZGCOT), then Outdoor Retailer (OR) summer show. I gave a presentation on attracting tourists to your town through trails and my Tusayan Trails Plan at AZGCOT. A highlight was seeing author Roger Naylor receive a Lifetime Achievement Award and then getting to chat with him afterward. I attended the Spark 2020 conference before OR, it focused on diversity, equity and inclusion and was a great opportunity to meet with others doing this work. I also got to meet some Instagram friends in real life like Karen Ramos from Get Out, Stay Out, Jenny Bruso from Unlikely Hikers and Ambreen Tariq from Brown People Camping. Ancestral lands of the Sioux, Ute, Cheyenne and Arapahoe. Got to canyoneer Willow Canyon with my friend Russell James Newberg. Go check out his amazing paper art! I was featured on She Explores podcast, Because Trails Inspire and had a great time talking with Gale Straub about trails, adventures, and my background. Celebrated 15 years of marriage with Brian! Did a couple of swimming hikes in Sabino and Tanque Verde Canyons with friends old and new. I went up Mount Lemmon with Stina Sieg from KJZZ to film the story that was referenced in the beginning of the blog on diversity in the outdoors. Gave my Hiking the Arizona Trail talk at the Chandler REI with the Arizona Office of Tourism. They live streamed it and it was so neat to see people checking in from all over the world! Topped the month off with an overnight in the Santa Rita Mountains south of Tucson. It was a wildflower wonderland, I saw over 30 different kinds! Ancestral lands of the O’odham and Yaqui. I saw that the sunflowers were going wild on the Arizona Trail in Flagstaff, so I set out on a road trip to capture them and do more book research. Ancestral lands of the Western Yavapai, Hopi and Apache. Outdoor Project included me in their Women in the Wild series, make sure to look at the other women featured, it’s a great list! Trails Inspire signed the Phase 2 contract for the Tusayan Community Trails Plan, which will largely focus on environmental studies in compliance with federal NEPA regulations, tribal consult through the Kaibab National Forest and an interpretive plan for signage. The proposed Grand Canyon History Trail will focus on the story of the associated tribes as well as the history of tourism in the region. On National Public Lands Day, I went to the Vermilion Cliffs to see the Peregrine Fund release four California Condors. It was majestic to see the massive birds take to the skies, free for the first time. Visited the Kaibab Plateau to get the first of the fall colors on the Arizona Trail at East Rim Viewpoint. I had hoped that this certain grove of aspen would be changing in Tater Canyon and I hit it just perfectly! Ancestral lands of the Northern Paiute and Ute. Then I was back to my favorite place in the world, Grand Canyon. The upper part of the North Kaibab Trail is in the book and I was hoping to get some fall photos there as well. When I arrived they were just starting to change. I had a little time to kill so I went to the Backcountry Office and got a walk-in permit for a night at Bright Angel Campground and one at Cottonwood CG. I was so excited, I hadn’t been all the way down the North Kaibab since 2014 and I had such a good time. My friend Ranger Della was down there and we got to catch up. It was so good to visit the Colorado River and Ribbon Falls, soak in Bright Angel Creek and enjoy the marvel that is the 14 miles that make up the North Kaibab Trail. The last couple of years, I have taken a leisurely approach to hiking out of Grand Canyon and it has made it so much fun! I had seven miles to hike out and 4200 feet of elevation gain. I took ten hours, waking up early and getting on trail at first light to beat the heat, but then taking long breaks, enjoying the scenery, taking photos and videos and savoring the experience. By the time I hiked out, the leaves had changed on the upper part of the trail and I got the fall color I had come to photograph. What a great bonus trip. Ancestral lands of Northern Paiute and Ute. Back to Flagstaff for fall colors on the slopes of Mount Humphreys. I had to run to Tusayan to take care of some business so I stopped by the South Rim Grand Canyon and got to see an inversion. I discovered the timelapse function on my Iphone and caught this dance of mist and light. I attended the SHIFT conference in Jackson, Wyoming and got to meet some other people doing work on diversity and inclusion in the outdoors. Also got to see the Tetons for the first time and was lucky enough to have Jaylyn Gough from Native Women’s Wilderness take me out to see the sunrise in the park. Ancestral lands of the Cheyenne, Eastern Shoshone and Shoshone-Bannock. For Halloween, I did a solo overnight bushwhack to Table Mountain in the Catalinas and transformed into a butterfly on the summit. Tough hike full of spiny and painful plants but worth it to see the views. The Arizona Office of Tourism sponsored a trip to Minneapolis and I gave two talks on Hiking the AZT at the REI flagship location. One of the highlights of the trip was taking a tour of Paisley Park, Prince’s estate. He was such a talented musician and I really enjoyed the experience. Ancestral lands of the Dakota/Sioux and Anishinaabe. Wrote a retrospective of this blog on the 9-year anniversary of Sirena’s Wanderings with my favorite photos and hikes. Spent some of the month organizing the book research and photos that I’d completed so far and writing. Took an impromptu trip to Aravaipa Canyon for fall colors and was thrilled to get this photo. Joined Women Who Hike for a group event at the Linda Vista Trail and Summit Hut. Fun to meet like-minded ladies! Traveled to Tusayan for a Stakeholders meeting for my trails plan and had to go see the snow covered Grand Canyon. It was super cold (9 degrees at night!) so it was a short trip. Continued to write and go through the hundreds of photos I’ve taken so far during the book research process. Headed down to the Mexican border to surprise Art “Karts” Huesonica at the end of his record setting Arizona Trail hike. He did a calendar year Yo-yo: hiked it northbound in the spring, and southbound in the fall, a distance of 1600 miles! Watched the Geminid meteor shower from the Tortolita Mountains north of Tucson and got some fun light painting shots. Spent four days in the Copper Corridor on the Arizona Trail hiking and researching the book. I was shocked to see how many wildflowers are blooming, even poppies! What a year! Thanks to all who have followed along. For years, I’ve said, “This is the year I’m going to write a book”, and I’m so grateful that it has now become a reality. The way that Sirena’s Wanderings came about is that in 2008-09 I section-hiked the Arizona Trail to raise awareness for Fibromyalgia and kept a website for it. I enjoyed sharing my adventures so when that hike was over, I started this blog. Here’s a collection of my favorite photos from the last nine years. What fun to see the progression of my outdoor skills (and hiking fashion)! Grab a beverage, there’s about 50 photos, most of them have links back to the blog entry for more information. When I started this blog, if you’d told me that in nine years I’d be working as a professional in the outdoor industry, canyoneering down waterfalls, scrambling and climbing peaks and retired from guiding on the river in Grand Canyon I’d have been incredulous. Who knows what the next nine years will bring? Samaniego Ridge from the Baby Jesus Ridge Tr. Weavers Needle – I climbed that! Happy New Year from Prominent Point! In 2014, I thru-hiked the AZT and developed the Arizona Trail Trek to promote the trail, the new AZT guidebook that I helped to write, and the Gateway Communities. For 2 1/2 months I hiked, held 12 fundraisers for the trail, took over 100 people on the trail with me on 5 backpacking trips and 7 dayhikes and raised almost $18,000 for the Arizona Trail Association. It was the trip of a lifetime. I’d hike the AZT a third time, it’s that good of a trail. Tunnel Falls, Columbia River Gorge – a magnificent place to be! In 2015, I started working on my Grand Canyon Traverse, hiking the length of Grand Canyon in sections. I’d done sections of the Tonto Trail since 2009 but this meant I’d commit to traversing the whole 277-mile length of the Canyon. Still working on it and about a third of the way through. When I’m done it will be more like 600 miles of hiking. 2017 brought a whole new adventure – starting my consulting company Trails Inspire, LLC! Trails Inspire promotes the outdoors via writing, public speaking, photography, and trail design and development. Escalante Route, Unkar Overlook with India – Photo Mark S.
In 2018, I got my very first book deal with Wilderness Press to write Day Hikes on the Arizona National Scenic Trail! It’s due out in Spring 2020 and I’m having the best time doing the research. Wow, that’s a lot of wandering – I so enjoy sharing my adventures with you, thanks for reading! And thanks to my sponsors: Gossamer Gear, Huppybar and Purple Rain Adventure Skirts for all the support over the years. And extra gratitude for my husband Brian – even though he’s not a hiker, he’s been an amazing support crew and partner through it all. And by the way, I am still a volunteer at Wildlife Rehabilitation in Northwest Tucson and still consider it to be one of the best ways to spend my time. So grateful to be able to do this work. I’ll be doing my usual year-end wrap-up here next month. Here’s to the next nine years! So much going on! Instead of my usual triplog format, I thought I’d give folks a update on where I’ll be doing presentations and links to recent media I’ve been featured in. Thursday, April 26th at 7:15 pm – I’ll be doing a brand-new free presentation “From Suburbanite to Adventurer” at Summit Hut’s location at 5151 E. Speedway. I’ll be telling the story of how I got into hiking and the outdoors, sharing stories from my adventures and giving tips on planning your own! This talk is part of their Shop and Talk Shindig with raffles, giveaways, beer and wine from 6 – 8 pm. 1990’s modeling photos of a much different Sirena- if I can learn to be outdoorsy, anyone can! Saturday, April 28th – I’ll be at the Continental Divide Trail Kickoff event in Silver City, New Mexico giving a talk on Desert Hiking Tips at 1 pm, and I am also part of the Thru-Hiker Panel at 3 pm. All presentations are at the Western New Mexico University campus, in the Student Memorial Building 3rd Floor Seminar Room. Saturday, May 5th – I will be a guest on the popular radio show Rosie on the House, talking about my adventures, Trails Inspire and the Tusayan Community Trails Plan. Click here to find broadcast times in your area or to listen to the show after it’s aired. Hope to see some of you at these events, all are free to the public! As far as adventures go, Hike The Loop was a complete success! I hiked 80 miles in 5 days along with award-winning author Liz Thomas on Pima County’s urban trail system. We had so much fun exploring the parks, art, food and communities on The Loop and our hike into the Completion Celebration was fantastic. We invited the public to join us on the last four miles and they had a wonderful introduction to the trail system. Visit the Trails Inspire blog for detailed media coverage from the journey. I climbed Baboquivari Peak again with my dear friends Dave Baker, Wendy Lotze and Gary Hervert. That place is magical and challenging and I am fortunate for any time spent there. The biggest news, however, is that I finally got the section of Grand Canyon done that I had to get helicoptered out of in 2016 after tearing my calf muscle! I spent a wonderful week solo from South Bass to Hermit. I’ll get to writing it up sometime soon, still going through the many photos and videos. Not only did I get that section done, it connected a big chunk of my line through Grand Canyon, 65 river miles from Nankoweap to Elves Chasm. Piece by piece, I’ll get the whole thing hiked someday. So there it is – lots of travel, spreading the word about the outdoors and working on my trail project in Tusayan. The Community Trails project is currently in the public comment period until May 7th and you can see the Master Plan that I developed and leave your comment about the plan at this link. It’s been a crazy-busy spring, but I wouldn’t have it any other way. Glad that the company is doing so well and that I’m getting all these fantastic opportunities! Hard to believe ten years have passed since I started blogging at the beginning of my first Arizona Trail hike way back in 2008. Thanks to my readers for your support through the years! What a year this has been! I have been kept quite busy by my consulting company, Trails Inspire, and sadly have not posted much on Sirena’s Wanderings this year. However, this post will catch you up on what’s been going on, there are many links to follow as well to articles I’ve written or appeared in. I thank all the readers that have followed me for the past eight years I’ve written this blog and those who find my posts a resource and inspiration for their hikes. A Grand-Canyon sized thanks to Gossamer Gear and Huppybar for their support of my adventures! If you’d like more frequent updates on where I’m wandering, follow me on Instagram at @desertsirena. Here’s my favorite shot of the whole year, condors J4 and 02 playing queen of the rock in Marble Canyon. Now on to a look back at 2017! At the beginning of the year, I returned to volunteering at Wildlife Rehabilitation Northwest Tucson. I had taken a break for about a year or so and was so happy to be back! Volunteering there is one of my favorite activities and I am so fortunate to get to specialize in working with raptors – hawks, owls and falcons. I filed the official paperwork in January to form Trails Inspire, LLC, my consulting business. Trails Inspire promotes the outdoors through photography, public speaking, freelance writing, and trail project management. Thanks to Wendy Lotze for designing my beautiful logo! Visit the website to learn more – I am currently booking speaking and writing gigs for 2018, contact me at sirena@trailsinspire.com. We’re also on Instagram and Facebook. January 25th marked the 20th anniversary of my accident, when I was hit by a truck while walking across the street. That moment changed my life forever and I wanted to commemorate it with an outing in the Mineral Mountains with my friends Wendy and India. They were very good sports about it even though temps dipped into the 20s. As a result of that accident, I developed fibromyalgia, a chronic pain condition that made me very ill for most of my twenties. I found hiking while trying to manage my condition and it led to wellness and adventures I’d never thought possible. It was a bittersweet trip, I had gone a decade without a flare. Yet on the anniversary of my accident, I had been in a flare for two months already with no sign of it abating. I tried to find the gratitude in still being able to use my body to get outside. Rather than sit at home and feel bad, I chose to feel bad in nature and keep hiking and backpacking. It helped my mental state immensely. I took a roadtrip from Chicago to Tucson with my dad and we entertained ourselves by using the Roadside America website to find attractions to visit along the way. It even made Nebraska interesting, a feat I formerly thought impossible. We saw the World’s Largest Buffalo Nickel and Ball of Stamps, historic sites, and sculptures ranging from epic to ridiculous. I had an article published about the 5 Best Hikes in Superior for the Pinal Nugget, which gave me a great excuse to visit for research. I hiked to the top of Picacho Peak for my 43rd birthday and again a week later with my nephew Gage. Gage moved to Arizona from Michigan and I’ve really enjoyed introducing him to hiking. Perfect weather for a birthday hike! Backpacked the first 60 miles of the Sky Island Traverse with Amanda “Not a Chance” Timeoni from Cochise Stronghold East through the Dragoons, over to the San Pedro River and followed the river down to the San Pedro House. I loved hiking among the giant cottonwoods of the San Pedro and there were lots of interesting side trips along the way to see archaeological sites and historic structures. I managed to hike a 20-mile day in spite of being in month five of my fibromyalgia flare. It was a triumph that made me feel better mentally if not physically. Chance was a great hiking partner and I really enjoyed her company. She’s hiked over 14,000 miles on long distance trails since 2009. I attempted again to hike from South Bass to Hermit in the Grand Canyon, the hike I’d been helicoptered out of with a torn calf muscle the year before. Alas, the roads were muddy and we couldn’t get to the trailhead so I hiked the Escalante Route from Tanner to Grandview again. Not a bad plan B – the Escalante Route is beautiful and there was a prolific wildflower bloom that was unlike any I’ve ever seen in the Canyon! The week after my Grand Canyon hike, my six-month fibromyalgia flare finally subsided and I was so grateful for my renewed health. It had been mentally and physically exhausting to be in pain all the time, there had been a searing nerve pain in my right scapula along with the accompanying symptoms of fatigue, anxiety and depression. I hope that it will be another decade before my next one. No picture because it’s an invisible condition, I look the same whether I’m in a flare or not. Sadly, upon hiking out of the Canyon, I learned that the Wildlife Rehab had suffered a devastating fire that burned parts of the facility and resulted in the deaths of over 30 of our birds. The saddest part was that three of our educational animals, who we’d had for a decade, perished in the fire. Heartbreaking. I gave a couple of talks in April – the first was about historic sites on the Arizona Trail for the Glen Canyon Natural History Association in Page. You can listen to a radio interview I did about it. It gave me a great excuse to do some exploring in the area and I hiked to the Colorado River via Cathedral Wash and got to see condors sitting on an egg from the Navajo Bridge. In Silver City, New Mexico, I gave a talk on Hot Weather Hiking Tips at the Continental Divide Trail Kickoff and also published an accompanying article for the American Long Distance Hiking Association – West. Canyoneered the Salome Jug in the Sierra Ancha with Meg and Russ Newberg. It was a gorgeous, sculpted pink canyon with lots of fun swims. I spent some time in Oracle, north of Tucson, volunteering with the Arizona Conservation Corps to maintain my 3-mile section of the Arizona Trail for which I am a steward. My Oracle Adventures: 3 Hikes article was published by the Copper Town News and I got to visit one of my favorite places, the High Jinks Ranch. My nephew Gage went with me on his first backpacking trip, I chose Hutch’s Pool and he did great! It was a toasty hike in but the swimming made it all worth it. I advocated for our public lands and urged people to submit their comments for the review of 27 National Monuments by the current administration. In June I started my company’s first big contract – to develop a community trails Master Plan for the Town of Tusayan, Gateway Community to the Grand Canyon and Arizona Trail. I traveled to Tusayan to meet with local business and landowners, the Kaibab Forest and Grand Canyon National Park. After work, I got to visit the Canyon and camp in the forest, it was amazing! At the Wildlife Rehab, work continued on the facility and I put together a fundraiser event – After the Fire – to supplement the donations that were coming in online. It was a wonderful event at Sky Bar with fantastic entertainment and people really enjoyed meeting our remaining educational animals. For Father’s Day, one of my stories about my dad was featured on the She Explores podcast. My dad has been a great supporter of my adventures, but we didn’t always get along when I was growing up. Right before the monsoon rains comes Saguaro fruit season and this year was incredible – so much fruit! I harvested, dried and made plenty of fruit leather to last the rest of the year. I visited Aravaipa Canyon for a leisurely trip with lots of hanging in the hammock, coloring, writing and listening to music. It’s always a gorgeous destination and the trip revitalized me for the whirlwind that was the rest of the month. Wendy and I had a rare moment in the same town at the same time and we hiked the Florida Trail in the Santa Ritas, a new one for me. Monsoon rains were great this year and when I hiked Pusch Peak, the normally-dry fall was flowing and there was even enough water to take a swim in the canyon! I attended the Arizona Governor’s Conference on Tourism representing Trails Inspire and reconnected with many colleagues and made new contacts. Outdoor Retailer’s last event in Salt Lake City was at the end of the month. There were a number of events about women and diversity and I really enjoyed the sense of community that grew out of them. I wrote a story about it for Gossamer Gear’s blog. I also had a photo featured in Liz Thomas’ Backpacker Long Trails book. It’s a photo from my hike into Grand Canyon with the Warrior Hike veterans program. After developing and getting responses on a public questionnaire, I held a public meeting for the Tusayan Community Trails Master Plan, which also meant that I got to visit the Canyon again. My friend Meg had been wanting to try out backpacking so I put together a trip to the Wilderness of Rock on Mount Lemmon. It was one of the most intense nights of lightning I’ve had and one Meg will not soon forget. A couple of days later, I was in Oracle when they got over 4 1/2 inches of rain in one night! Brian and I met my dad in Garden Valley, Idaho for the Solar Eclipse. It is hard to describe what a profound experience it was during totality. Brian, an amateur astronomer, had been telling me about this eclipse for the last 10 years and I’m so glad we made the trip. We also got to visit the World Center for Birds of Prey in Boise, what a treat! Took Gage on an overnight to Josephine Saddle in the Santa Ritas and we also summitted Mount Wrightson. Wrightson was my first big peak and I was excited to share the feeling of triumph with my nephew. He absolutely loved it and was amazed at the views and accomplishment. We had an epic sunset on the way back to our camp. Summit of Mount Wrightson – 9456 ft. Returned to Tusayan to lay out a potential trail corridor based on the public and stakeholder feedback from the questionnaires and meeting. I worked with Mark Flint, of Southwest Trail Solutions, who has designed miles and miles of trail for Pima County and the Arizona Trail. The layout was a lot of fun and we ended up with 13 miles of new multi-use non-motorized trail. The part I’m most excited about is the Grand Canyon History Trail, an interpretive trail that will tell the human history of the Grand Canyon area from Native American times to the present. Unfortunately, I had been having some continued troubles with harassment that escalated to the point of interfering in my new business. It had been a source of stress and anxiety that required me to seek not only legal help but also counseling. When the #MeToo coverage started blowing up in the news the following month, I could relate all too well. Not all harassment is of a sexual nature, but at the base of it all is the same power struggle. I am fortunate to have good friends and family, a supportive husband and a wonderful counselor who have helped to see me through. Back to adventuring, I had always wondered what Upper Romero Canyon looked like and finally got to see for myself. My buddy Russ and I canyoneered down sculpted granite corridors and rappelled down waterfalls. It was good training for my upcoming big Grand Canyon trip. Got a couple of horseback rides in with Carrie Miracle-Jordan on JJ. One of the most amazing events I’ve ever put together of is Force of Nature: Women Who Inspire. I came up with the idea for the event when Niall Murphy from REI Tucson approached me about doing a presentation. Instead of just me doing my thing, Trails Inspire co-sponsored a multi-sport women’s panel discussion with a mountain biker, an equestrian, a rock climber, an ultrarunner and me, the backpacker. We had 200 people, mostly women, attend at the Tucson Hop Shop and it was everything I’d hoped. Women came away inspired and empowered to take on their own adventures and connected with each other and local community outdoors groups. My friend Heather “Anish” Anderson came to visit with her boyfriend Adam after they’d both hiked almost 4000 miles on the Oregon Desert Trail, Colorado Trail and Continental Divide Trails. Check her Instagram @anishhikes, she’s always up to amazing things. After taking a couple days off, they were ready to hike so we backpacked from the top of Mount Lemmon out to Sabino Canyon so I could test my knees for my Grand Canyon trip. We spent the night at Hutch’s Pool and had a great time and the knees were ready to go! I presented the Tusayan Community Trails Master Plan to the Town Council and they voted a unanimous yes! Next step is opening the Master Plan for a round of public comment and another public meeting, sometime early next year. Got to see the Grand Canyon by air thanks to Grand Canyon Helicopters, the flight path went right over the route I was planning to hike. The Butte Fault/Horsethief Route was one of my favorite adventures to date. A whole week of fresh scenery, unusual geology, challenging terrain and logistics and breathtaking beauty. It felt so good to be out there solo, on my own timeline, feeling strong. Quite the different experience than the trip earlier in the year when I’d still been in a fibromyalgia flare. If you’d like to see what gear I bring, you can read this Gossamer Gear article about it. Butte Fault from the helicopter, Awatubi/Sixtymile saddle below. Six months after the fire at the Wildlife Rehab, Janet got to move back into her house and ready it to start accepting animals again. Thanks again to all who donated their time, talents and funds to help rebuild. The new structures and aviaries are better than ever, we’ll be doing an open house event once it’s all complete. I grew up in the Chicago suburbs, two houses away from my best friend Kristin. We met when I was four and spent our childhood exploring together. My mom was forever sending her brother looking for us in the patch of woods by our house. I moved away in 1994 but we’ve stayed close all these years across the miles. Our lives couldn’t be more different, and she came for a visit to experience a vacation like none she’d had before. I set up a camping and hiking tour of many of my favorite places in Northern Arizona and we had the absolute best time!! We started out with a night in Flagstaff, then I got to take her to see the Grand Canyon for the first time. It was such a blast, doing all my favorite things, and seeing Kristin experience them with fresh eyes. She was a great sport, and I took her camping in Marble Canyon and to the Navajo Bridge and Lee’s Ferry. The highlight was watching the California Condors play king of the rock, I looked them up and they are both females, born in 2011 and 2013. I have never gotten a chance to photograph them in action before other than soaring way above. We finished the trip with a hike on the Arizona Trail in Flagstaff and then she was back to Chicago. We’re already plotting her return. 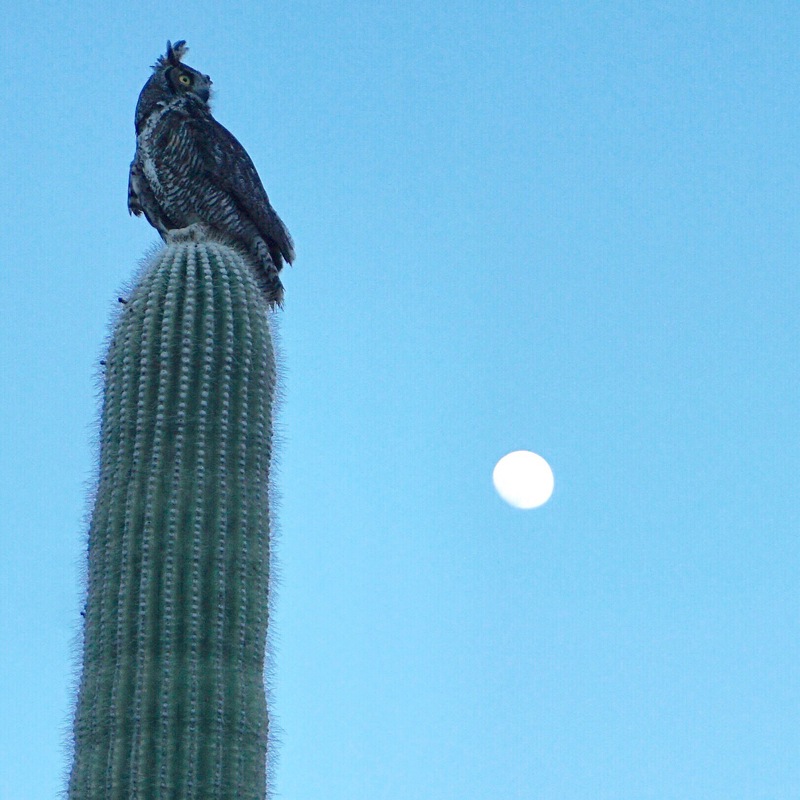 Since we lost our educational Great Horned Owl, Luna, in the fire, I started training a new one. It’s been an incredible process to take a wild bird (it can’t be released because of a wing that didn’t heal properly) and work with it week after week to get it used to being comfortable perched on a glove in public. For Thanksgiving weekend, I got to house sit at one of my favorite spots in all the land, the High Jinks Ranch near Oracle. It was all I’d hoped and I got some great night shots and quality time on the Arizona Trail. Trails Inspire and I were featured in Phoenix Magazine’s December issue in a wonderful article by Mare Czinar. After my Grand Canyon trip in October, I wanted another adventure to look forward to, so I asked my friend Mitch if he knew anyone that could help me climb Finger Rock. On the ascent to the base of the Finger, my quads started cramping. It was confusing, I had consumed what I thought was plenty of water, food and electrolytes, but it just wasn’t meant to be. I was able to make it to the base and decided not to go up the climb, just couldn’t take the chance of cramping up while on rope. I have been consciously practicing gratitude, so after a fleeting moment of feeling bad that I didn’t get to summit, I was able to enjoy the fact that I still got to see a new part of the mountain, take in the amazing views and get epic photos of my friends. What a great day, I’ll be back! My dad came for a visit and we traveled to Whitewater Draw for the sunrise to see the Sandhill Cranes. It was a chilly 25 degrees, but worth it! We stopped for a fall color fix on the Arizona Trail in Cienega Creek from the Gabe Zimmerman Trailhead. Fall in December, only in Arizona! Always good to travel with my dad. To round out the year, I teamed up with Mitch and Bill for a holiday hike up Buster Mountain in Catalina State Park. I’ve been hiking with these two since our trip up Ragged Top in 2009 and the companionship is always top-notch. I’m really looking forward to 2018 – lots of adventures planned, continuing to work on the Tusayan project, and more pieces of my Grand Canyon Traverse. One of the most exciting projects is writing a book about my story – from the accident that caused my fibromyalgia to the outdoor woman I am today. I’ve written several chapters so far and it’s been an amazing experience to revisit how very far I have come. Best wishes to all for the New Year and see you in 2018! For the 101st Anniversary of the Park Service, I decided to finally get around to publishing a trip in the Grand Canyon that I did in April. Happy Birthday to America’s Best Idea!! Before I get into my long overdue Grand Canyon triplog, here’s the reason I haven’t been posting much lately: I have been very busy with my new consulting company for trails and communities, Trails Inspire, LLC! The mission of Trails Inspire is to promote community trail use, development and tourism through project management, freelance writing, photography and public speaking. For more information on our services, visit www.trailsinspire.com. I am excited to be working with the Town of Tusayan to develop a community trails system Master Plan as well as some writing assignments and public speaking engagements. I’ll be posting updates on the Trails Inspire blog and social media, so give us a follow on Facebook, Twitter, or Instagram! Sirena’s Wanderings will remain active for me to continue sharing my adventures hiking, backpacking, rafting and canyoneering. On April 1st, 2016, I was on day 2 of a hike from South Bass to Hermit in the Grand Canyon when my calf muscle tore. I had to be evacuated out, full story here. I got invited to do the same trip exactly a year later and was excited to have the opportunity to get that piece of my Grand Canyon Traverse completed. Unfortunately, the day before our hike in there was wet snow everywhere and we couldn’t make it to the remote South Bass Trailhead. Plan B was to do the Escalante Route and Tonto Trails from Tanner to Grandview. It was snowing all morning as we shuttled cars and we couldn’t even see the canyon from the Tanner trailhead at Lipan Point. We hiked on snow for a short distance and descended out of the clouds to dry trail. No traction devices needed, though I was carrying some just in case. By the time we reached 75-Mile Saddle, we began seeing our first blooms – Cliff Fendlerbush. Traversing through the Supai, we got a momentary respite from the downhill. I was wearing patellar tendon straps on both knees for more support and they behaved all trip. I got giddy as we approached the Redwall Overlook. There is a short spur trail before the Tanner Trail dives through the Redwall with one of the most wonderful views upstream. Someday I am going to camp there. On this day, we made do with an extended break. As we descended in the Muav, we saw the first of many Mariposa Lilies. I have never seen so many in one trip! We played a game to see who would spot the first blooming cactus. I saw a bright pink beavertail and the wildflowers multiplied as we lost elevation and hiked down from winter into spring. The constant sloping descent on the Dox Formation finally ended and we took an amazing break at Tanner Rapid, soaking our feet in the icy waters of the Colorado River and watching the waves. It’s been two years since I guided on the river and I definitely miss it sometimes. We still had three miles to go to get to Cardenas beach, our camp for the night. We started the Escalante Route, which was well-traveled and dipped in and out of every ravine. It felt great to arrive at the beach and I was so tired that I didn’t even get up or take photos at night. I had been experiencing a Fibromyalgia flare for the last 5 months and had done a 60-mile test backpacking trip before this on the Sky Islands Traverse. Fibromyalgia is a chronic pain condition that I have had for 20 years, since I was hit by a car while walking across the street. I hadn’t had a flare for 10 years and the pain and fatigue were just as unbearable as before. I was having nerve pain on the right side of my back that was there 24/7, fatigue and hypersensitivity to touch. One of the problems is the neurotransmitters don’t function properly, causing pain, depression, anxiety and sleep disorders. As always, time in nature made me feel better and kept my mind off of the problems I was having with my body. If I am going to feel like crap anyway, I at least want to be enjoying the outdoors. I was glad my body held up to our long day. The next morning, we were covered in dew and spent a while drying our gear out before moving on. We hiked up to the Hilltop Ruin and marveled at the 360 degree view. It was only a short distance through fields of yellow flowers before our next stop at the Unkar Overlook. I love this spot, you can hang your head over the sheer cliffs and look down at Unkar Rapid and the Unkar Delta ruins across the river. The route ascended as we traveled toward Escalante Creek. There are a number of spots that would make a great dry camp with views. We found a small seep of water in the bed of Escalante as we hiked down toward the beach. After an Escalante Beach break with wave-watching, we hiked up through fields of blooming Brittlebush to 75-mile Canyon and followed the rim until we could get into the bed. The hike down the canyon to the river at Nevills Rapid is delightful and we spent a while enjoying the textures and colors of the Shinumo Quartzite slot canyon. We had Nevills to ourselves and I stayed up well after Mark and India went to sleep doing night photography and having my own personal beach dance party. Day 3 we took the low route to Papago Canyon and I found a river-level juniper, which is quite rare and made me very happy. Grand Canyon Junipers are my favorite tree of all. We got to the Papago Wall and Mark headed up to drop his pack and help India climb up. I went up next, no big deal since I’d done it before and knew there were giant hand holds all over the place. India did great and got up the wall wearing her pack. We climbed some more and squeezed through a tight spot, then reached a great view downstream toward Red Canyon. The Papago Slide is a 300 foot rockfall made of every size of rock imaginable, most of it loose. We carefully picked our way down, leaving plenty of space between us. As we neared Hance Rapid, we saw some boats arrive at the scout point. Yay! Getting to see oar boats run one of the biggest and most technical rapids was awesome. As we took our break, another giant group of kayakers and boaters from the Czech Republic showed up and ran the rapids. Some of them even portaged their boats around to run it a second time! The weather started to change as we sat at Hance and I even had to put my puffy jacket on. Clouds rolled in, which was nice because we had a bunch of climbing to do to gain the Tonto Platform. The Tonto Trail begins at Red Canyon and the layers slope upward because of the appearance of the Vishnu Schist and Zoroaster Granite that make up the Upper Granite Gorge. As we reached Mineral Canyon, it started to snow! Big, fat wet clumps called snow cones (Really! Mark is a meteorologist). There was a handy overhang for us to suit up in our rain gear. Snow turned to rain and we climbed out of Mineral Canyon, finally reaching the Tonto Platform near Ayer Point. The rain was really coming down as we got to the camp spot I used in 2015. We used teamwork to put my Gossamer Gear The One tent up first and stash the packs inside the vestibule so we could put the other two up. It rained for about two hours and when it stopped we emerged to the most spectacular scene of dramatic light and snow-frosted Canyon complete with rainbows and an amazing sunset. I went to sleep and woke up about 3 am to answer nature’s call. The sky was outrageously good with the Milky Way prominent. I put all the clothes I had with me on and got my camera. It was chilly and I had to dance around to keep warm but the photos I got were worth it!! The next day we followed the Tonto into Hance Creek and took a break near the inscriptions. I couldn’t find the one that said HANCE and there was a big hole taken out of the wall. Could someone have taken it? People are so strange. I had not done the Tonto around Horseshoe Mesa and it went quickly and was covered in Claret Cup Cactus, Indian Paintbrush and Mariposas to our delight. We also saw blooming Redbud trees, a favorite of mine. As we rounded the corner of the west arm of the mesa, Zoroaster, Brahma, Isis and the Cheops Plateau came into view. It was nice to see these familiar landmarks. We reached Cottonwood Creek and found a spot for the night. India and Mark were on the ledges near the waterfall, I climbed up to a spot just big enough for one on a perfect Tapeats ledge complete with my own personal camp juniper. We explored downstream a little ways, it’s very pretty with small cascades and ledges. I made a plan to return at night. I set my alarm to go off at 3 am since I had such good luck the night before and I was not disappointed. The Milky Way was bright over Grandview Point and I took photos until the stars faded at 4:30 am. I was reluctant to leave the Canyon, I could have easily spent another week down there. I joked that they should leave me and I could just subsist on begging extra food from incoming backpackers who had overpacked. India was a little intimidated by the climb out and I told her that we were going to make it fun by taking a bunch of breaks and going at whatever pace she wanted. I was secretly pleased that no one wanted to rush out and get home and that Mark wasn’t in a hurry either. We climbed and climbed out of Cottonwood Canyon and took an extended break on the “neck” of Horseshoe Mesa. The Grandview Trail is crazy steep, but we just took our sweet time. Another long break at Coconino Saddle and as we gained elevation we could look back on our entire route from the last five days. They practically had to drag me out of the Canyon, as I said, I was not ready to leave. There had been a lot of work done on the trail since I last hiked it and it was in great shape. We passed clean, perfumed dayhikers and answered questions like, “did you spend the night down there?” And just like that, we were at the trailhead and it was over. I was pleased to get through the trip even though I was having a fibromyalgia flare and my knees held up really well. The best part was that three days after I hiked out, my nerve pain in my back finally went away and I began to feel better. So relieved! The physical and mental anguish was exhausting and having the flare has made me so thankful for the times that I am feeling good. I will be returning in October to do another piece of my section hike of the length of the Canyon and I can hardly wait.